For many of us, our TVs take pride and place in our living rooms, and for good reason. After a long day, there are fewer finer feelings than getting comfy on the sofa, kicking back, and relaxing in front of your favourite TV show or series. When it comes to our TVs however, we want them to not only look the part, but to also be functional and practical. Having an attractive DIY TV stand certainly makes life easier, but which style should you choose? Well, that all depends on your decor and your tastes. Some people prefer ultra-modern, whilst others go for a more rustic and traditional look. Whatever you decide to go with, you can rest assured that you can save yourself a small fortune if you choose to create the stands yourself, which is where we come into the mix. 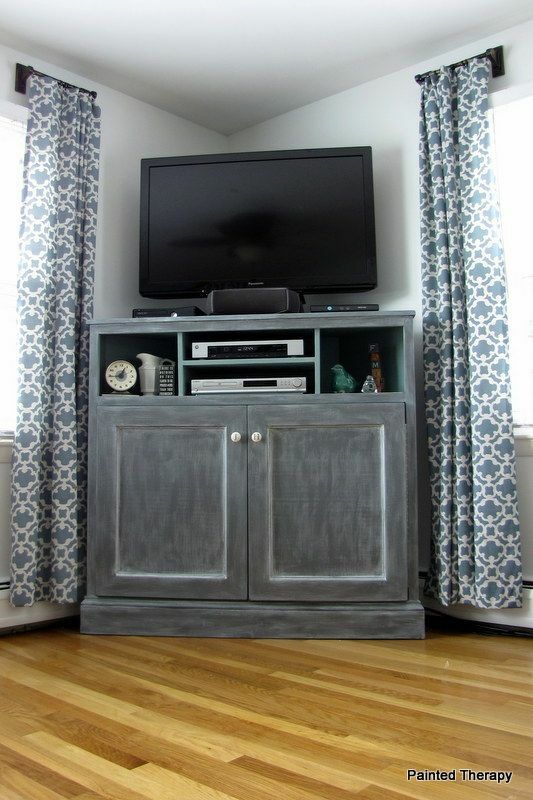 Below we’ll provide you with a series of TV stand ideas you can build and assemble yourself with minimal effort. 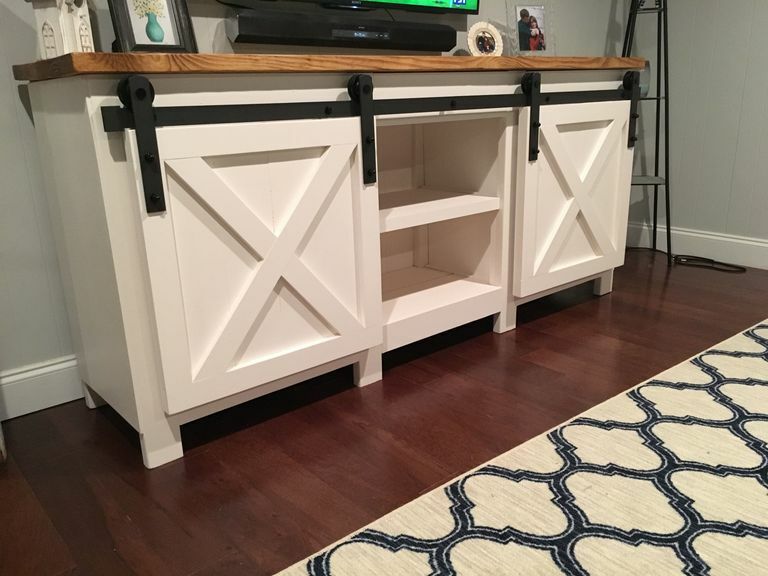 If you’re feeling especially creative, check out this farmhouse media cabinet from Build Something, and see how you get on. The stand itself is perfect if you are looking for a country cottage vibe and require a great deal of storage. There are decorative glass doors, shelving units, painted components, decorative hinges, and much more besides. If you’re confident in your DIY, head on over to Build Something and check out what you need, and what you need to do. 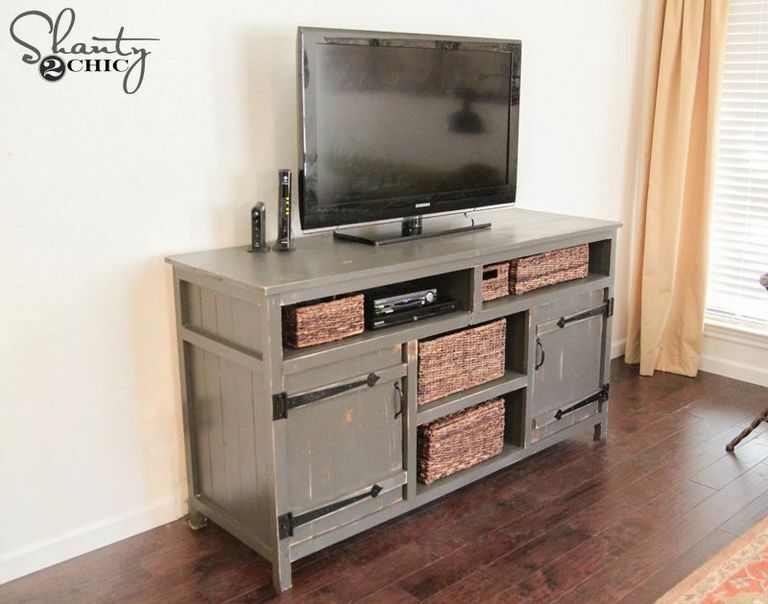 This DIY rustic media centre offered by Shanty 2 Chic is perfect for people with an eye for rustic charm and decor. The unit itself offers both closed shelving hidden behind two doors, along with open shelving which is perfect for storing DVD players, Games consoles, etc. The great thing about this media centre is the fact that you can follow the plans and give the unit its own unique twist, and with a different coat of paint, you could create a whole new unit entirely. For detailed instructions, include a video tutorial, check out Shanty 2 Chic now. If you’re looking for a fairly simple DIT project with a minimalist finish, this is the perfect stand for you. There are X frames and planks, along with two large open shelves offering plenty of storage. The X frame for example, may sound complex. But is fairly simple to create and it looks absolutely stunning. Take a look at the following as you will receive detailed instructions and materials lists so you can build this console to enjoy for decades to come. This rustic X console stand is a work of art to behold, and if completed correctly, will look absolutely stunning. Taking inspiration from Pottery Barn consoles, this unit is actually made up primarily of 2 x 4 pieces of wood. This means that, although it will look stunning when complete, to build it, you won’t actually need to spend all that much at all. Head on over to Ana White’s site and check out the video tutorial, along with shopping list, detailed instructions, and images to help get you up and running. 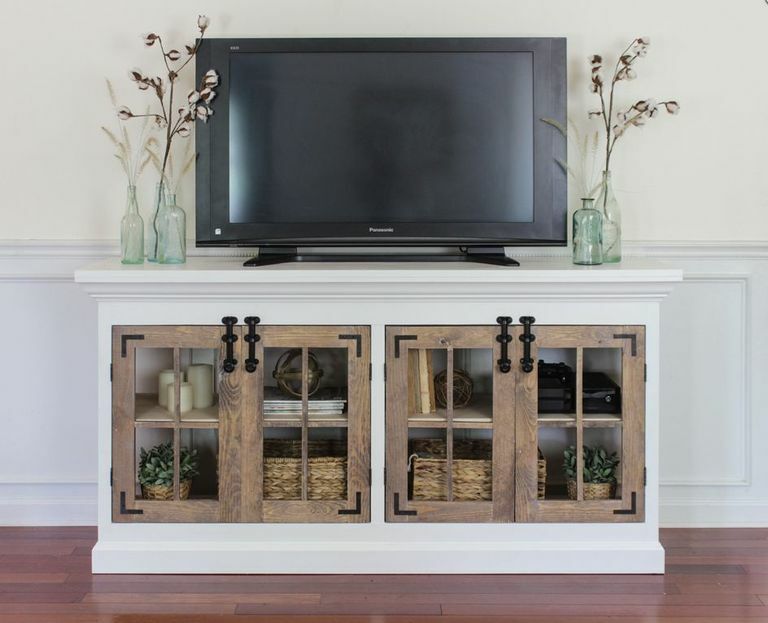 We aren’t done with Ana white just yet, as this sliding door console is another rustic-themed stand which would look right at home in a traditional farmhouse or cottage. The plan is completely free and allows you to get a little more creative as there are sliding doors available this time. This, along with the closed shelving, will offer plenty of storage space and will brighten up any room. Head on over to Ana White’s site and check out the detailed instructions, as well as the images submitted by other user’s who created this console themselves. Here you can see the slight alterations they have made so you can custom-build the console to best suit your decor and interior. Corner media centres are very popular and practical, and this offering from Rogue Entertainer is no different. It features stylish X frames on the side, along with long open shelving units for plenty of storage. The great thing about this design is that, because of the materials and the design itself, you can actually create the finish you want, so that it blends effortlessly in with the rest of your furnishings. Take a look at Rogue Entertainer’s detailed instructions and see just how simple this build really is. Here’s another from Ana, and this is perhaps the best of the bunch. 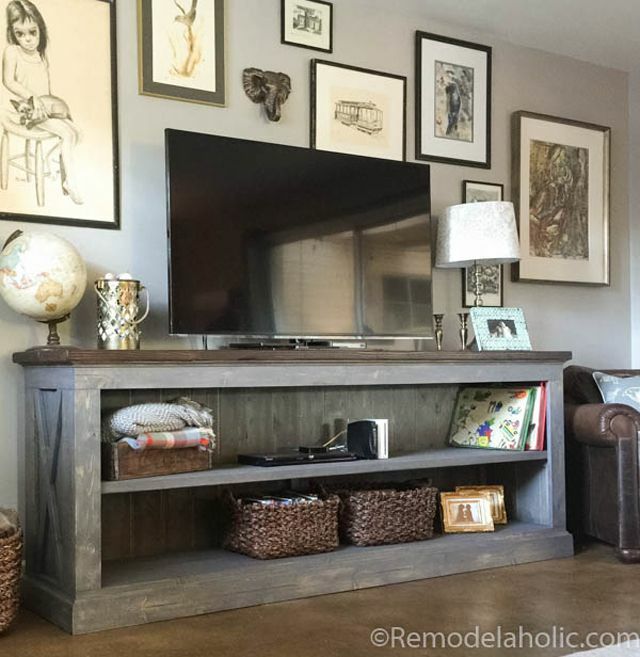 This TV stand is tall, as opposed to wide like many of the others on this list, making it great for slightly smaller rooms, or rooms with awkward layouts. By now you probably know what to expect over at Ana’s site, so head on over and see what you need, and what you need to do. 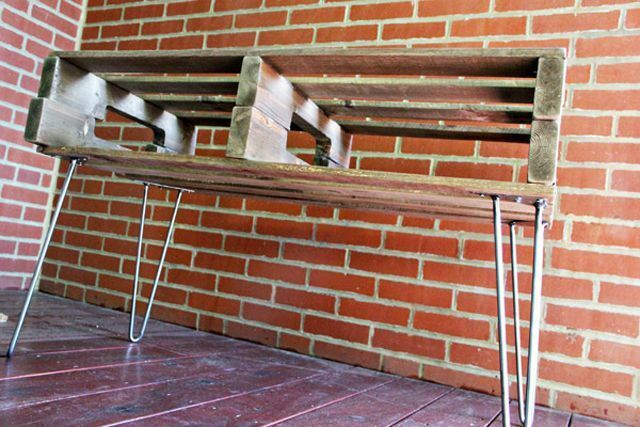 Upcycling is now very popular, and there is seemingly nothing you cannot do with an old wooden pallet. 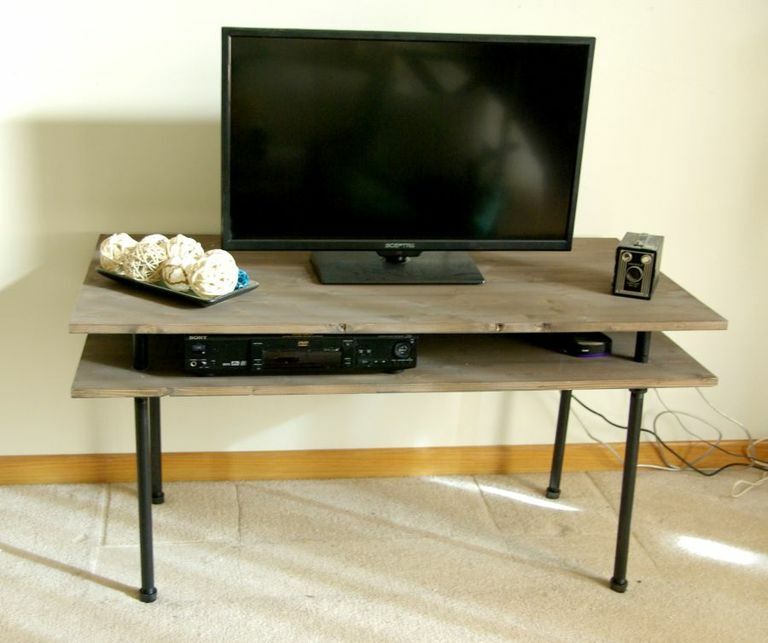 Needless to say, this pallet TV stand idea from Preparing for Peanut is an upcycler’s dream come true. 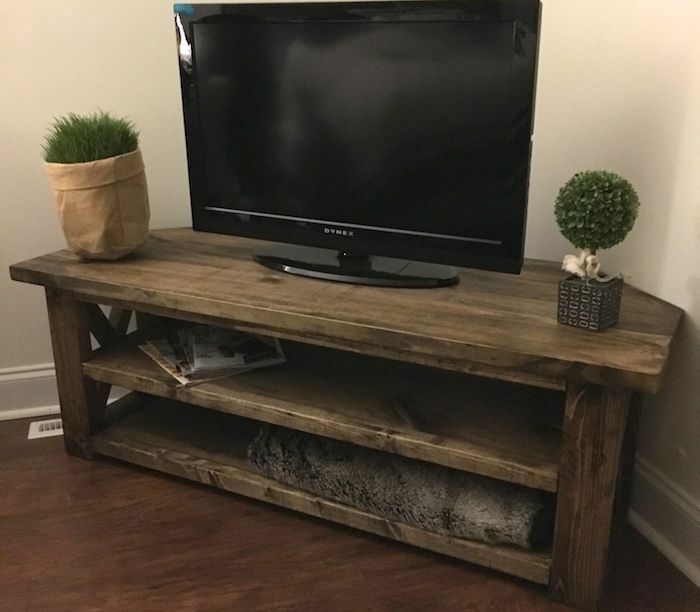 Basically, with hairpin legs, wood stain, an old pallet, and your usual tools and accessories, you can create a stylish industrial/urban TV stand that is very practical, and that looks amazing. There are plenty of detailed instructions and images for you to follow, and if you are fairly new to DIY, this is a great place to start. If you’re new to DIY and are looking for a simple and basic project to begin with, this is it. Built with galvanized pipes and thick boards, this stand is painfully simple to make, yet it looks stunning. 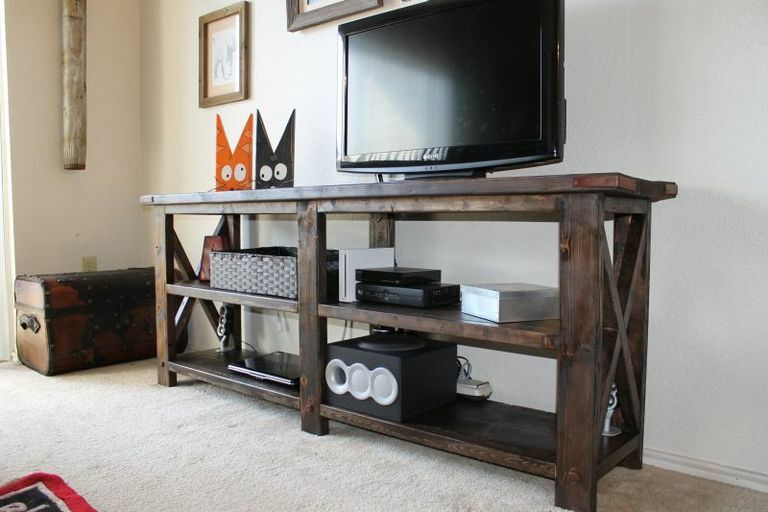 With a feel of industrial chic about it, this DIY TV stand would look ideal in a slightly modern downtown apartment. The plans are very simple to follow, and although basic, the finished product will look fantastic.